Sorry about the heading, it is a bit sensationalist isn’t it, but true. Raw diets have been the cause of many illnesses in people, and pets alike. "No Raw Food here... its all healthy cooked fat!...... Where's the bucket! " Pet nutrition, is one of the most difficult topics that a vet has to discuss with pet owners, as we know pet owners are all filled with their own experiences, opinions and, now, they are able to be convinced so easily by fellow pet owners via the internet. Veterinarians need facts to survive. We like studies, and proof. The issue with the raw diet opinion is that it appears to be driven by a firm belief of the conspiracy of pet food companies killing our dogs through contaminated preservatives. It isn’t as much driven on the premise that raw is the best food for your pet. I can make such a bold statement because of something I was part of in the 1980’s. As a vet student I was in a lecture on canine medicine where the speaker was verbally abused because she would not advocate raw bones as the “right diet” for dogs. Her scientific researched showed the facts then, as it stands now. Raw bones are not a natural diet for dogs. That is a pure, irrefutable, fact, supported by multiple studies. Yes, dogs like to eat them.... we like our chocolate bars too! Chocolate is "natural" too, but despite what we tell ourselves, they are not a food group nor a complete diet for us. Neither are bones or raw food for our dogs. And yes it is sad, but true -----I have to report, there is no conspiracy of pet food companies to kill our pets. Sad, I know! I like conspiracy theories as much as the next person! In fact, our pets are living longer than ever, thanks to improved nutrition. Now, before I go on further, I have state for the record that I am not against home made diets at all. In many conditions, this is what we may need to do, and this is where your veterinarian can help you. We can help you ensure that you give your pet a nutritionally balanced diet. Sadly, a raw food diet isn’t balanced, nor does it claim to be balanced either. When our own dog Teddy was being treated with lymphoma, we did explore, and feed him, a home made “cancer” diet. We like to believe that this helped prolong his life. With our current dog, Piper, who has food allergy (and atopy), we are super strict on what she eats - some of it home made, and some commercial. On our website page, we have links to veterinary nutritionists, who will help you formulate a home made diet for your pet. But there is an important part to the “home made” recipe which is absent in the raw food diet - the meat and carbohydrate are cooked, and every attempt is made to ensure that it is nutritionally balanced and appropriate for that pet through adding essential vitamins and minerals. 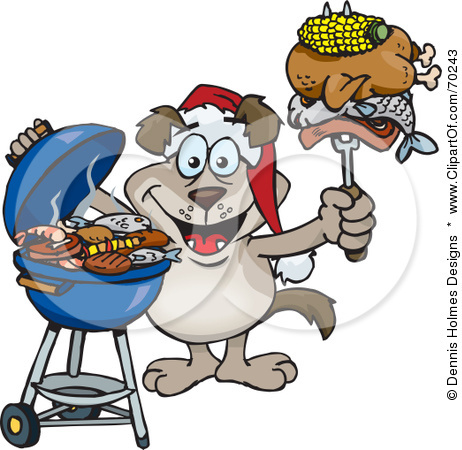 It is well documented that the health of man (and our animal friends) improved as soon as we learnt to cook our food. The cooking process is able to kill off many of the bacteria that is capable of causing illness in us (and our pets), such as E. Coli, Salmonella and Campylobacter. People get sick and die from eating raw eggs (it happened in Brisbane a few years back with the mayonnaise), or unpasteurised milk (in Victoria). Yes, our pets can get food poisoning too. Other serious issue with raw meaty bones include fractured teeth in young animals, severe constipation and death as a result of the feeding of raw bones. These are preventable problems. Our dog Piper, at the beach! There are many out there who have found their pet’s coat are shinier, that their teeth are whiter, and that their pet’s bowel problems have resolved by changing to BARF. I could equally argue the same thing with our beautiful dog Piper, who everyone comments on how shiny her coat is! But let us use the “At the end of the day” statement on raw food diets. 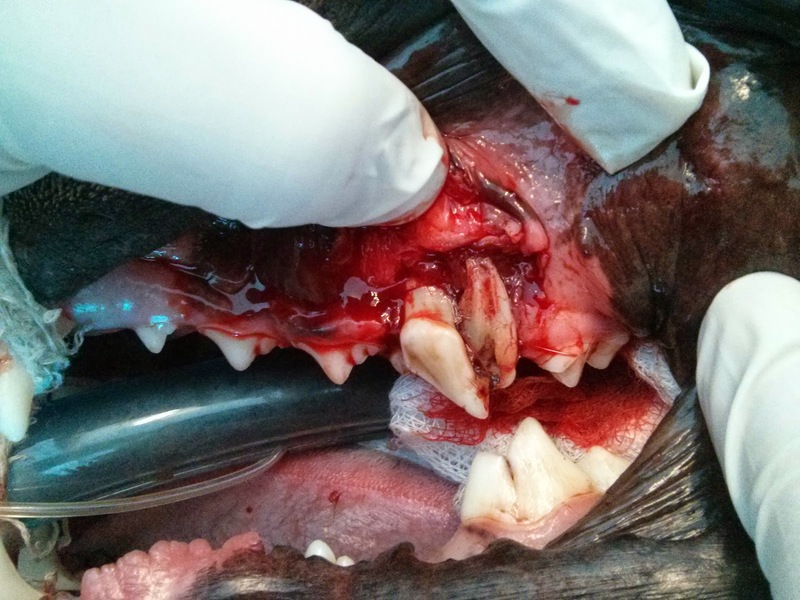 A broken tooth in a 8 month old Great Dane. At the end of the day, it does matter the type of food you feed your pet, as it will have a big impact on their health (and yours). Just do not let it be an adverse effect. At the end of the day, I know you love your pet, whether you feed them raw, cooked home made or commercial prepared foods. We all want happy and healthy pets, always. I am Dr Liz, the mad vet from Bellambi. I look after dogs and cats from the Northern Suburbs of Wollongong, including suburbs such as Austinmer, Thirroul, Bulli, Woonona and as far south as West Wollongong and Mangerton. In fact, I have clients in every suburb in the Illawarra, and some from Campbelltown and Gerringong too. Any questions or comments, you can email me directly. I have to thank Dr Chan for his lecture at the 2015 PanPac conference in May 2015 for the inspiration for this post.